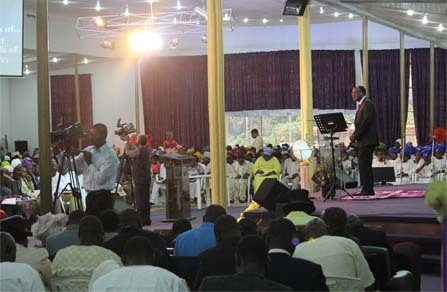 Partnership with the Name of Jesus Ministries International involves a covenant connection. It is a commitment to assist Rev Dr. & Rev Mrs. Idowu with fulfilling their God-given destiny to impact the lives of millions by spreading the gospel worldwide. Every soul saved and every life transformed through TNJM is credited to the heavenly accounts of our partners. A partner shares responsibility in some common activity with another individual or group. A partner of The Name of Jesus Ministries International is someone committed to this ministry and shares her vision. Partnership is the relationship between people who support one another in the achievement of a common goal. Partnership isn’t a one-time event. It’s a growing, thriving commitment where we both share in the benefits promised to us when we come together and spread the cause of Christ and further God’s Kingdom. In partnering with us, you’ll be distinguishing yourself as someone committed to the Name of Jesus Ministries Int’l and one who shares its vision to save the lost, help the hurting, and spread the Gospel. By no means is partnership just an avenue by which to raise finances. Instead, It is a mutual exchange of faithfulness. Rev. Dr. & Mrs. Idowu faithfully and actively pray for partners. They declare the blessing – the empowerment to prosper and excel – on their partners. Partners of this ministry have right to connect to the anointing that is on this ministry so that they, too, can prosper spiritually, socially, mentally, physically, emotionally and financially. It’s not just what we SAY…it’s what we DO. Always pray for God’s blessings to be on you. Minister to you through a personal letter from Rev. Dr. John Idowu. Always pray for the ministry.